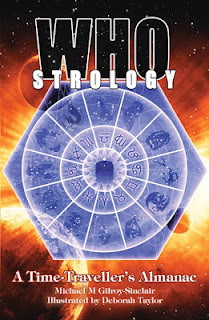 Whostrology: Time Travellers Almanac is the hilarious astrological guide book based on every one of the 750 plus broadcast episodes of BBC Televisions Doctor Who. it's a worthy tome, presenting a day-by-day selection of astrological readings, plus zodiac information ... everything you need ... really. Note this tongue in cheek guidebook can be used in ANY year and is NOT specific to 2013/ The 50th Anniversary! Deborah Taylor has been a Doctor Who fan since she was five and has contributed illustrations for fanzines such as The Terrible Zodin and The Eleventh Hour. She would really like to spend more time drawing and eating crisps. TO ORDER YOUR COPY CLICK ON ONE THE LINKS BELOW. Some gifts are truly rubbish, your brother may look very pale and act oddly – be afraid. It is a good time to prepare for embarkation; A red head surprisingly enters your life and acts like she has known you for an age. There is nothing you can do about this. The writing is on the wall at an ancient poison factory so shatter your chains and come into the water.